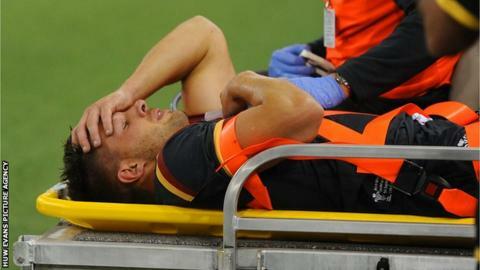 Wales scrum-half Rhys Webb has been ruled out of the Rugby World Cup because of a foot injury. Webb joins full-back Leigh Halfpenny in missing the tournament after being injured in Saturday's final warm-up game with Italy in Cardiff. The 26-year-old is replaced by Lions scrum-half Mike Phillips while Ospreys wing Eli Walker is also drafted back in to the squad to take Halfpenny's spot. Both were part of the extended training pool but did not make the final cut. Webb posted a message on social media saying: "Really disappointed to be ruled out of the RWC. After all the hard work I've put in over the summer, words can't describe how I'm feeling." And Wales head coach Warren Gatland said: "It is extremely disappointing for both Leigh and Rhys. "They have worked exceptionally hard to establish themselves on the world stage and to prepare for the tournament and we wish them all the best with their recovery. "After announcing the squad we spoke about the need for players to remain ready for action and it is a great opportunity for Mike and Eli. "It's great that we can call on players of this calibre. To bring Mike's experience into the squad is a bonus along with Eli's exciting talent." Wales say Webb requires further assessments on both his foot and knee before details can be given about whether he requires surgery. He left the field on a stretcher during the first-half against Italy on Saturday after being caught in a ruck. Gatland's worst fears have now been realised with the loss of Webb and Halfpenny. Webb has established himself as Wales' leading scrum-half, having been outstanding during last season's Six Nations Championship. Halfpenny has scored 508 points in 62 appearances for his country and was voted man of the series when the British and Irish Lions beat Australia by two Tests to one in 2013. "Interesting to see if Mike Phillips' experience sees him leapfrog Gareth Davies and Lloyd Williams. Could he go from fourth to first choice? And reasons to be positive: Dan Biggar is a world-class goalkicker. Liam Williams is one of the sharpest attacking weapons in European rugby." Phillips will add plenty of experience on his return to the squad, having played in two previous World Cups during a 94-cap career. His five Lions caps mean he is one short of reaching the 100-cap milestone. The 33-year-old was discarded from the squad in August as Gatland chose Webb, Gareth Davies and Lloyd Williams as the scrum-halves. Walker is just starting his international career, the 23-year-old having only made his Wales debut against Ireland in August before being overlooked in favour of George North, Alex Cuthbert and Hallam Amos. Wales are banking on Liam Williams to prove his fitness and take over from Halfpenny at full-back, with the Scarlets back only recently returning to full training following foot surgery in June.